If you’ve visited my blog, it’s no surprise that I’m pregnant with my first baby. If you haven’t visited my blog before, welcome! And guess what? I’m pregnant with my first baby! So naturally I wanted to make everything that he needs with my own two hands. Although I can’t possibly make everything I’ve definitely made a lot of little things for him! I have two months left before my due date and the nursery is really coming together… like it’s almost done. And I am feeling more and more relieved every time a new addition makes it in there! 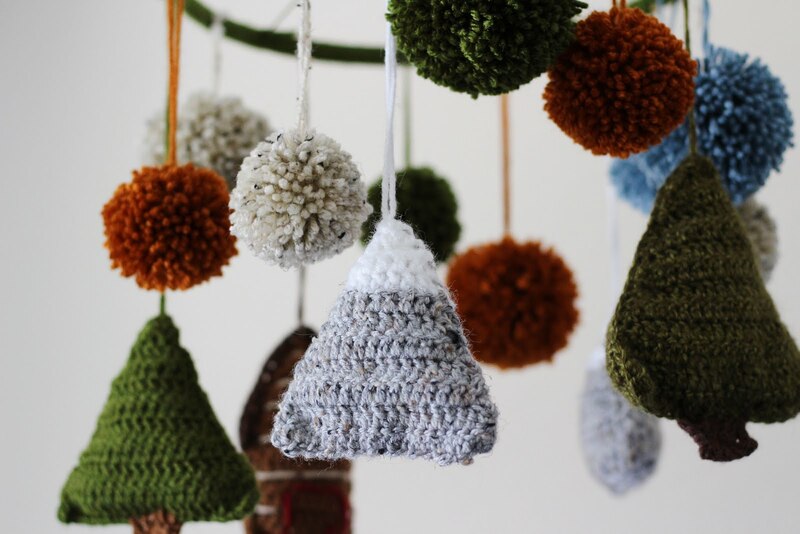 This week’s triumph was this cute little crochet woodland baby mobile! I spent a good amount of time researching mobiles – what look did I want? I wanted something that would match my theme (forrest, foxes, and bears-oh my!) but I also didn’t just want to buy something from the baby supply depot that looked mass-produced and generic. OH YEAH and those generic mobiles that sing and hook onto the crib? $50 for a woodland one! Come again?? I don’t think so! Not when I could make one that was waaaaay cuter and custom made to match the nursery for about $10. So after seeing some beautiful things on pinterest (and after becoming obsessed with my Clover Pom Pom Makers) I got to work! The handy video tutorial is below as well as the patterns for all the little stuffies that made their way onto this mobile! Sc 2 pentagons together around the 3 square sides (“floor” and two “walls” of cabin), leave the “roof” open. Suff with yarn scraps or polyfil. Roof: Attach chocolate brown yarn at “roof” edge & Sc across to close two cabins together, Ch 1, turn, Sc back across in the “roof” to other side, finish off, weave ends. Using tan yarn and a tapestry needle, sew stripes/lines along the cabin to look like logs. I sewed a line on every other row of stitches horizontally. I sewed a + inside a square to look like a window in mustard on one side and a red door on the other side. The options are endless with this cute little country cabin! I also made lots of pom poms to tie onto my mobile – here is my video tutorial on making pom poms us the Clover Pom Pom Maker! Tie all of your pom poms and stuffies onto your embroidery hoop using yarn! I placed mine at varying heights just for some variety. I also took some kelly green yarn and simply wrapped it around the embroidery hoop for a more finished look. This part was a bit tedious and time consuming but I love the look! I used more yarn and some strong fishing line to hang this guy from a reinforced hook in the ceiling (thanks, fiance!) And don’t worry, even though the photos make it look like this guy is hung above the crib, it’s actually just beside so my cute mountains and trees can’t fall on little Parker’s sleeping head! Hope you guys enjoyed this cute baby mobile!